Adding sublabels and description on Radio button fields? 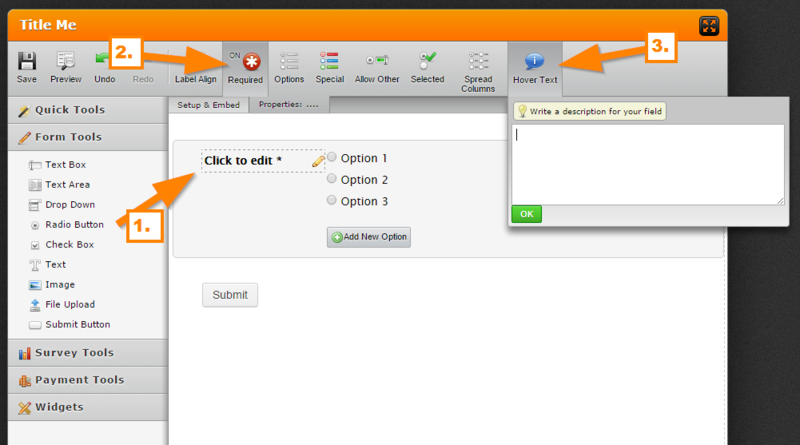 exists but help text (/sublabels/descriptions) should be a default option like other form builders (e.g. Google Forms). Having to spend time "faking it" by manually ID'ing and hiding labels in CSS doesn't gel with JotForm's WYSIWYG design. Apologies if I may have cut off the the part of your post incorrectly. Regarding your concern, could you share us some example on how you would like the sublabels and description to appear on a radio button? That will help us to forward this to our developers as a feature request. Currently the radio button has the hover text for the description. I appreciate the response regardless. I'm sure this feature has been requested before, probably several times under different names. However it's frustrating still having to use a CSS workaround when it seems so simple an addition. 'Hover text' is a different feature, which I gather is useless on mobile devices but that's another matter. Yes, you are right. For Sub-Labels, we don't have an alignment tool. As you have mentioned, the only way to change one sub-label's position is injecting a custom CSS to your form. Below, you will find the CSS that make sub-labels under the form-labels. Also, you can adjust the "px" value with respect to your needs. Also, if you want to apply this rule for specific sub-label, it can be done on "Designer". Thanks for contributing Mert. I was mainly using the Text Box Sub Label as an example of what I wanted Radio Buttons to have, although an alignment tool for both would be good. I'm familiar with adjusting margins in CSS and the custom CSS editor is a great feature. However one of the biggest selling points of JotForm is it's WYSIWYG approach, so it's jarring when you can't do something basic like Google Forms can do without 'coding' a workaround. If the Radio Button at least had the same Sub Label attribute the Text Box does I could apply margins to both with one value. Compared to the time-consuming method of the original post, which also has side effects like the required field issue I pointed out. You are definitely right about this one. Alignment of sub-labels need ready to use tool and some fields like radio buttons need sub-label. Now, I'm going to request this feature, so our developers will be informed about this one. Also, I will open a thread for alignment tool for sub labels. Thank you for your precious feedbacks. With that way, we can realize our shortcomings.